To create a perfect world what type of government would you propose? No, our agenda is not to fix America’s problems. That’s too tall an order for a free letter! Besides, America’s wounds are mostly self-inflicted – the result of free and fair elections (along with the usual fraud and delusions). Far be it from us to come upon the scene with morphine and bandages… and interfere with the workings of such a grand and elegant democracy! Besides, we’re too busy to fix America’s problems… or design a new government. We have problems of our own. Fences that need to be repaired. Toilets that need to be unclogged. And cabbages that need to be planted. Alert readers will spot the reference to Emperor Diocletian. After fixing the empire for 20 years – with acts in equal measure of genius, wisdom, and imbecility – Diocletian finally saw the light. He retired, returned to his home on the Dalmatian coast, and planted cabbages! Cabbages are real. And important. You can eat them. They can keep you alive. Government and its policies, its great causes, its Lincolns and Bonapartes, are confabulations of myths, hallucinations, conceits, and lies. Pharaoh was a god, the ancient Egyptians believed. So it made sense to scrape huge pieces of rock across the hot desert to honor him. Louis XIV was appointed by God. He had a “divine right” to rule, and if that was so, who could say no to him? And now, the myth-du-jour is that God stands shoulder-to-shoulder with 51% of registered voters; no matter what dumbheaded thing they do, they always have Him on their side. Alas, in modern democracy, the majority can’t really know what is going on or why. The world is too big… and infinitely complex. The sacred majority can’t follow the details of public policy, even in its backyard. Who among the 51% read the enabling act for Obamacare? Imagine trying to keep up with the shifting politics of the Middle East! The voters can’t tell a Shiite from a she-wolf. So, policies are set not by the voters but by the elite… the Deep State. Under cover of the dense claptrap and folderol, the elite figure out how to game the system. These “foxes,” as the great Italian economist, Vilfredo Pareto, called them, soon have the government doing their bidding. Can Donald Trump escape the foxes? The whispering has already started. 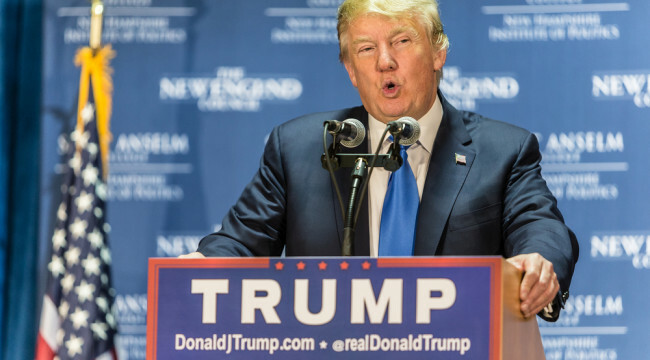 The foxes are already reconciled to “The Donald” as the Republican candidate. “We can work with this man,” they say to one another. “We may have to…” they sigh. And now, Mr. Trump must negotiate the most important deal of his life. The papers report that casino magnate and regular Republican donor Sheldon Adelson is considering a major investment in the Trump team. We assume he has worked out the terms; most likely Adelson – an ardent supporter of Israel – will insist on a continuation of the Bush-Clinton foreign policy. That shouldn’t be much of a problem. Trump has made it clear he doesn’t mind torturing people or killing their families, if that’s what it takes to keep the Deep State in business. And he is rumored to be considering Newt Gingrich for his running mate. That should reassure the Northern Virginia real estate market; the billions of dollars will continue to flow to the military-security-foreign policy industries and pay for McMansions in Fairfax County. And what about at health, education, and welfare? Then he quickly backed away from an honest discussion of America’s public debt. Someone must have let him know how it works. “Hey,” they probably told him, “we gotta fund the Deep State somehow!” Trump, a quick learner, even suggested a tax hike on the rich. Our guess is that the best dealmaker in the world will have no trouble finding a win-win with Washington and Wall Street. Our guess is that Wall Street will have no trouble convincing “The Donald “to continue the Greenspan-Bernanke-Yellen financial policies. Most likely, the ugly truth hidden in his tax records is that he has a lot less money than his bragging suggests… or a mountain of debt. Just guessing (to be confirmed or disproven by later events), but Trump built his fortune on bold moves, cheap credit, and lucky breaks. It would not be surprising if he were deeply in debt; who isn’t? And now, he needs the Fed’s low interest rates as much as anyone. But… but… but… No matter who is elected, he will have to come to terms with the real government – the foxes who run the Deep State. But remember our questions for today: This just democracy in action, warts and all, right? Nothing is perfect, right? There is no alternative, right? Of course, there’s a better system. Jefferson had the right idea. And Andrew Mellon. Friedrich Hayek. Ludwig von Mises. Milton Friedman. Murray Rothbard. Ron Paul. No Fannie. No Freddie. No trade deals. No foreign policy. All we can recommend is a smaller one. With less money to steal… and fewer cronies to steal it.